Two Ecotec-powered Chevy Cobalt SS race cars set land speed records yesterday at the Bonneville Salt Flats on the first possible day for record runs during the 58th Annual Speed Week event. The Bonneville Student Project Chevrolet Cobalt SS, based off a naturally-aspirated Cobalt SS and converted to run on E85 ethanol for 2006, set a 156.073 mph record in the G/FCC class (G Class/Unblown Fuel Competition Coupe), while the Chevy So-Cal Cobalt SS set a 218.392 mph record in the G/BFALT class (G Class/Blown Fuel Altered Coupe). Both cars were driven by GM Performance Division engineer Mark Dickens, who in the span of 35 minutes on Sunday joined the exclusive Bonneville «200 MPH Club» with his record in the Chevy So-Cal Cobalt and also became the first-ever driver to set a record using E85 ethanol. Three female student interns — 19-year-old Heather Chemistruck from Virginia Tech University, 21-year-old Lauren Zimmer from Purdue University and 21-year-old Sandra Saldivar of New Mexico State University — were among the many excited Bonneville team members as they helped convert the Student Project Cobalt to run on E85 for 2006 and are also part of the car's pit crew. Both Cobalts qualified on Saturday afternoon during the opening day of racing — the Student Cobalt with a speed of 156.695 mph and the Chevy So-Cal Cobalt with a speed of 220.517 mph. Once a car makes a qualifying run that beats the previous record holder's time, the car is immediately impounded until the next morning when it can return to the course for a record run. The combined average between the qualifying and record return runs are what establish a new record. The Student Cobalt broke a 19-year-old 152.626 mph record set in 1987 by Doc Jeffries, while the other Cobalt bested the previous GM Performance Division record of 212.684 held by GM engineer and fellow «200 MPH Club» member Jim Minneker in a Saturn ION Red Line. 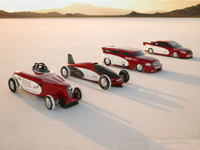 According to the Southern California Timing Association (SCTA), the group who sanctions Speed Week, the Student Cobalt is the first vehicle to set a record at Bonneville running on E85 ethanol. The Student Cobalt is also equipped with a nitrous oxide system for 2006, but the crew was determined to set a record using only E85 first to help showcase the inherent performance benefits of the fuel. To take advantage of E85's performance attributes, the students converted the Cobalt to run on the renewable fuel by changing the fuel cell liner, fuel filter, and engine calibration. «E85 has a higher octane rating than gasoline and burns cooler, which allows for increased power,» said GM Performance Division executive Al Oppenheiser, whose team heads up GM's efforts at Bonneville. The Chevy So-Cal Cobalt SS was long overdue for a record considering it stunned the crowd in 2004 with an unofficial 243.127 mph pass, earning it the nickname «243 Cobalt» However, because production had not begun on the Cobalt, it was ineligible to qualify for a record attempt. Last year, it was not able to set a record before the rain cancelled the event. To end the record-setting Sunday, the Student Cobalt again qualified to make a record return run today in the same G/FCC class with a speed of 159.407 mph. Ironically, the Cobalt's nitrous oxide system they had planned on using for yesterday's qualifying run had a minor glitch, and the car still ran a better speed on only E85 than its earlier record. Around 7 a.m. or so Mountain Time, Dickens will attempt to break the record the Student Cobalt set on Sunday, and the team has ensured the nitrous will be firing on all cylinders. «We've already broken the record using E85 alone, now it's time to have a little fun by applying a conventional performance enhancer to see how high we can boost our record,» said Chris Twarog, GM Performance Division engineer and Student Cobalt crew chief.